Laramie County Master Gardener Susan Carlson shows off peas growing in her straw bale garden. The spruce trees protect the garden from north wind and the shade cloth protects the delicate lettuce in the rest of the garden from too much sun. Photo by Barb Gorges. Did the thought of the work involved in starting a vegetable garden keep you from having one this year? Did time for all that rototilling or digging in of compost never materialize? Or maybe you tried a garden in our clay soils and results were poor? Straw Bale Gardens, by Joel Karsten, Cool Springs Press. Susan Carlson, a Laramie County Master Gardener, can recommend a solution: straw bale gardening. Her stepson, who lives in Minnesota, brought her the book by Minnesota native Joel Karsten describing his miraculous method. This is the second season Carlson has used rectangular straw bales for vegetables and her results look good. She also included flowers. The idea is that a straw bale is compost waiting to happen. Before the growing season begins, over a couple weeks, you add water and a little fertilizer—organic or inorganic—and it will activate an army of bacteria. The bacteria break down the straw, turning it into just what plants need. Plants can be inserted into the bale or seeds can be started in a little potting soil placed on top. The bale is like a container or raised bed held together with baling twine. You can set it anywhere, even on a driveway. You don’t prepare the ground underneath. And, depending on how clean the straw is, you will have few weeds, or wheat or oat sprouts, that can’t be easily removed by hand. You’ll have more sprouts if you accidently bought hay—which includes the heads of grain—instead of straw, which is just the stems. Straw bales might also be the solution to vegetable plant diseases that persist in soil. Gardeners are always advised not to grow the same family of vegetables (especially the tomato-eggplant-pepper family) in the same spot more than once every three years. You can start a fresh bale each year, although Carlson managed to keep her bales intact for a second year. First, obviously, she found straw bales. I checked a local farm and ranch supply store and their regular bale, about 3 feet long and 60 pounds, runs about $7. Avoid the super-compressed bales. A bale bought in the fall from a farmer should be cheaper than in the spring, after they’ve had to store them all winter. In fall, you can put your bale outside to weather. If you’ve had problems with mice or voles, as Carlson has, lay chicken wire or hardware cloth down first. Cut a piece big enough to fold up and protect several inches of the sides of the bale. Carlson’s straw bale garden consists of five bales forming a u-shape. They are planted with (from left) haricot vert green beans, cabbage, a tomato, lettuces, petunias and edible pod peas. Photo by Barb Gorges. Lay out your bale prickliest side up, and so the sides wrapped with twine not against the ground. Carlson bought five bales and formed them into a u-shape to fit within an area fenced to keep out her dogs. Because she planned to grow beans, Carlson made a trellis as well. She wedged two bales, lying end to end, between two 5-foot steel “T-post” fence posts (about $5 each) and then strung wire at about 10 and 20 inches above the bales. She can add more wire if the plants get taller. Karsten recommends 14-gauge electric fence wire (but you won’t be plugging it in). On the ground inside the u-shape of bales (or between your rows), Carlson laid landscape fabric. You could use some other material to keep light from germinating weed seeds, like a layer of thick straw, cardboard, wood, wood mulch, etc. Next, Carlson “conditioned” the bales, starting about two weeks before our last frost date, which is around May 22, though you can start a week earlier because the bales form a warm environment. The first step here is to find cheap lawn fertilizer with at least 20 percent nitrogen content as Carlson did the first year. Do not use one that is slow-release or that contains herbicides. You can also use organic fertilizers, like bone or feather meal, or very well-composted manure, but you need to use six times more than the amounts given for inorganic fertilizer. The second season, Carlson said, she is having good results using Happy Frog packaged organic fertilizer, but using much less since the bales were conditioned once already last year. The conditioning regimen begins the first day with a half cup of inorganic fertilizer (or six times more organic) per bale sprinkled evenly all over the top and then watered in with your hose sprayer until all of it has moved into the bale and the bale is waterlogged, writes Karsten. The next day you skip the fertilizer and water the bale again. Karsten suggests using water that’s been sitting out for a while so it isn’t as cold as it is straight out of the tap. Days three through six you alternate between fertilizer-and-water days and water-only days. Days seven through nine you water in a quarter cup of fertilizer per bale each day. The bales should be cooking by now and feel a little warmer on the outside. On day 10, add a cup of 10-10-10 garden fertilizer. The numbers mean 10 percent nitrogen, 10 percent phosphorus and 10 percent potassium. Next, lay out your soaker hoses on top of the bales if you are going to use drip irrigation as Carlson has. On day 12, Carlson transplanted one cherry tomato plant directly into the bale, wedging it in. Smaller plants are easier to plant than large ones and will soon catch up. “Bacteria are breaking down the inside of the bale and making this nice environment,” said Carlson. Carlson’s Haricot vert beans. Photo by Barb Gorges. Mostly, Carlson wanted a salad garden and so she started everything else from seed: edible pod peas, Haricot vert beans (a type of tiny French green bean), lemon cucumbers, broccoli, spinach and various lettuces. She packed a couple of inches of sterile potting soil (not garden soil) into the tops of the bales in which to plant the seeds. The warmth of the composting straw got them off to a good start. She added shade cloth overhead to protect the lettuces from too much sun and started cutting romaine and butterhead lettuce by mid-June. Carlson also used shade cloth on the west side fence to keep the wind from drying out the bales too quickly. And there you have it, a vegetable garden—or a flower garden if you prefer—ready to grow. All you need to do then is to garden as you normally would: enough water, fertilizer once a month, and pull the occasional weed that may sprout, or pick off any little slugs or insects. Maybe because of our dry western climate, Carlson was able to use her bales this second year. The bales shrank a little so she patched the gaps between bales with bits of chicken wire on the sides and filled them with potting soil. One question is what to do with the old bales. They are great compost for conventional garden beds. Carlson reached into the side of one bale and showed me lovely black soil. If you don’t have any conventional garden beds to add it to, someone else would be happy to take the compost off your hands. While most straw bale gardeners start with fresh bales each spring, Carlson was able to use hers for a second season. She pulled away a little straw on the side of this bale and discovered it is full of rich compost. A soaker hose keeps the vegetables watered. The green steel fence post is part of the trellis system. Photo courtesy Barb Gorges. Categories: Compost, Container gardening, Drip irrigation, Garden pest, Garden site prep, Gardening, Straw bale gardening, Trellis and vine, Uncategorized, Vegetables | Tags: compost, container gardening, drip irrigation, garden, gardening, Joel Karsten, Laramie County Master Gardeners, Straw bale gardening, vegetable gardening | Permalink. Once the leaves are gone for the winter, we have five or more months to admire the structure of deciduous tree trunks and branches. So how about adding more vertical interest to your garden or the side of your house with a trellis? The purpose of a trellis is to get vining plants off the ground, which is handy in the vegetable garden. The simplest methods involve stakes, string and wire cages. But these are temporary. Instead, let’s look at more permanent trellis ideas used with ornamental vines. Some trellises are attached to walls, some are free-standing, and some are formed into arbors, meant to be walked under. Some can even be sculptural parts of dead trees or scrap metal. Or perhaps one of the porch posts will do. David Mullikin built this trellis from lattice panels. It supports several different vines. Sometimes, the desire for a trellis comes first, rather than the desire to grow a vining plant. Is there a plain wall or fence that needs something to dress it up? Is there a view you would like to block? Is there a view you would like to frame with an arbor? Are you looking for some shade? Need a little height to give your garden some pizazz? Trellises with engineered straight lines and perfect curves can offer contrast to natural vine shapes. Trellises with a less formal structure can blend in with nature. As you drive around town this winter, look for trellises. Some are obviously the kind you buy, the simple fan shapes, lattice panels or ladder shapes. But there is some original artwork out there. Wood is the easiest for most of us to build with, but if you are thinking long-term, be sure to use wood that will endure, like cedar. 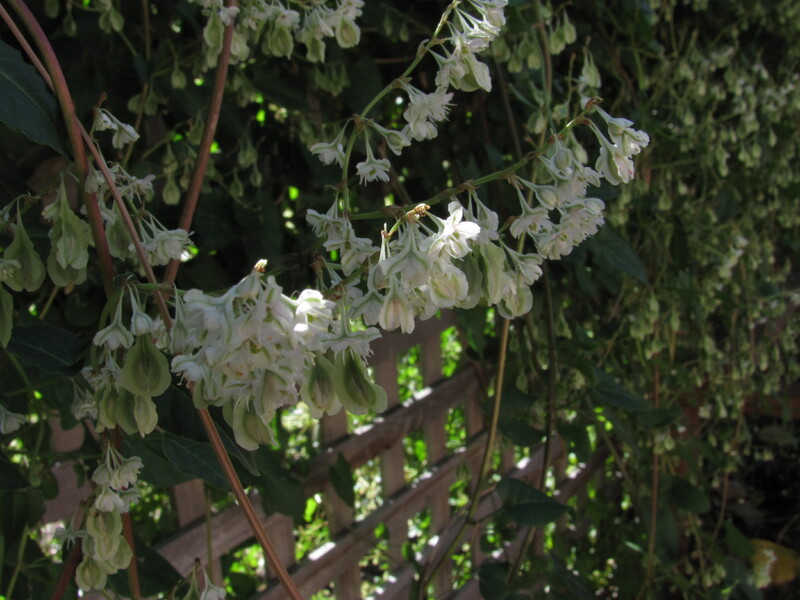 You don’t want to get trapped into having to paint your trellis, especially if you are contemplating a perennial vine that adds growth from year to year. But if the vine gets cut back annually, re-painting might be possible. Bruce Keating’s unique trellis, made from an old car spring, bounces in the wind. Metal is the best. Wrought iron looks good for a long time and it is sturdy enough for heavier vines. Or how about pipe? Copper looks really nice and might not be so hard to work with, although you don’t want it to be publicly visible or someone will steal it for its cash value. Jeff and Mary Weinstein attached box springs to their fence to support grape vines. But perhaps you aren’t a welder. Then it is time to think creatively about repurposing. My friends Mary and Jeff Weinstein had an old box spring they needed to dispose of. After removing the cloth and wood, the springs are attached to their wood fence and covered by their grape vine. An arbor or pergola is roof-like. It can include sides that are trellises or just the support posts. The roof can be flat or arched. Short arbors form a doorway from one area of the garden to another. Martha Mullikin, a Laramie County master gardener, makes sure her arbors frame views, even a focal point as simple as a container of bright annuals. Despite her several arbors being made of different materials, she chose them all to be flat-topped, echoing the same form. Bruce Keating welded this Victorian rose temple together from scrap metal and trellises. More elaborate is the “Victorian Rose Temple” in Bruce and Carla Keating’s garden that Bruce welded, offering support for climbing roses on all sides. Plus it is a shady place to sit. Susan said perennial vines are not going to cover the new trellis at once. And she had some advice on where to plant vines. 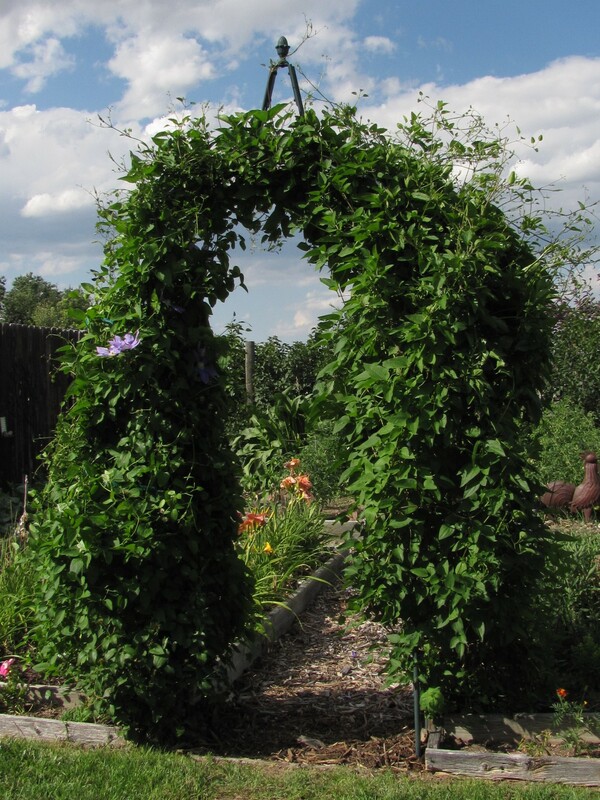 Martha Mullikin’s arbor, adorned with a new clematis, frames a view of her yard. As I researched each of the recommended vines, I noted they prefer sunny to partly sunny locations. All vines flower, some more noticeably than others. Except for grapes and hops, any fruit produced is appropriate for birds, not people. All vines mentioned are perennial, except morning glory and annual sweet pea. Orange-red flowers attract hummingbirds. It can be an aggressive grower. Flowers on new wood, so it can be pruned in early spring without affecting blooming. –Jackmanii—purple flowers, spring & early summer blooming, can be pruned in early spring. –Henryi—white flowers, blooms in June on last year’s wood, blooms again later on new wood. –Nelly Moser—pink flowers, late spring and summer. Prune no more than top third. –Sweet Autumn—white flowers bloom on new wood so prune after blooming. Native and very hardy. Odd, but interesting green flowers. It dies back after frost and grows new shoots from the roots in spring. Hops are an ingredient in many beers. Blue-flowered varieties are most popular. Blooms most prolifically beginning in late summer. Needs lots of sun and water. Can be seeded directly when soil temperature is 60 degrees, but speed things up by starting inside three weeks early. Prefers poor soil. Supposedly grows 8 feet long but mine went 18 feet this summer. Grow multiple vines in each location. Purplish-pink flowers fade to white and are not fragrant. Blooms mid-season. A low water and low maintenance plant. Seeds are poisonous. Fragrant blue, pink, purple and white flowers. Prefers cool, but sunny locations and lots of water. Plant seeds up to 3 weeks before last spring frost. Yellow flowers in late spring, but large, silvery leaves are its hallmark. First propagated and grown by the Kintzley family in Iowa in the 1880s and rediscovered in Fort Collins and propagated by Scott Skogerboe. Red trumpet-shaped flowers bloom much of the summer. Blooms on previous year’s wood, so prune after flowering. Japanese honeysuckle is less hardy here, but is considered an invasive problem in 29 eastern states. Flowers are not noticeable, but the birds love the berries and drop seeds that sprout all over my yard. Leaves turn red in fall. Little disks allow vines to adhere to walls, a problem when removing them. White flowers bloom in late summer, early fall, and well into October this year, Martha Mullikin told me. It is considered a relatively fast and hardy grower. Technically, climbing roses don’t twine around or attach themselves to trellises, but they can use the support. 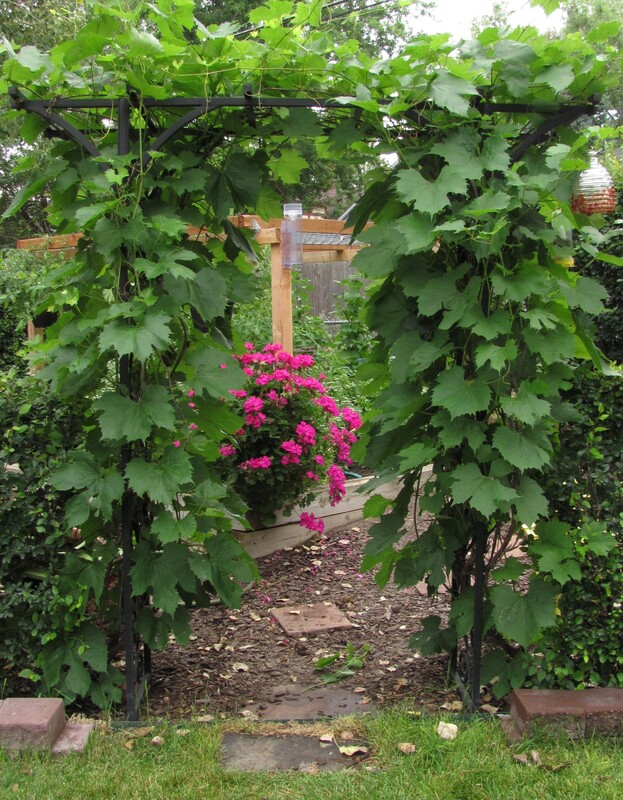 A grape arbor marks the entrance to Martha Mullikin’s vegetable garden. 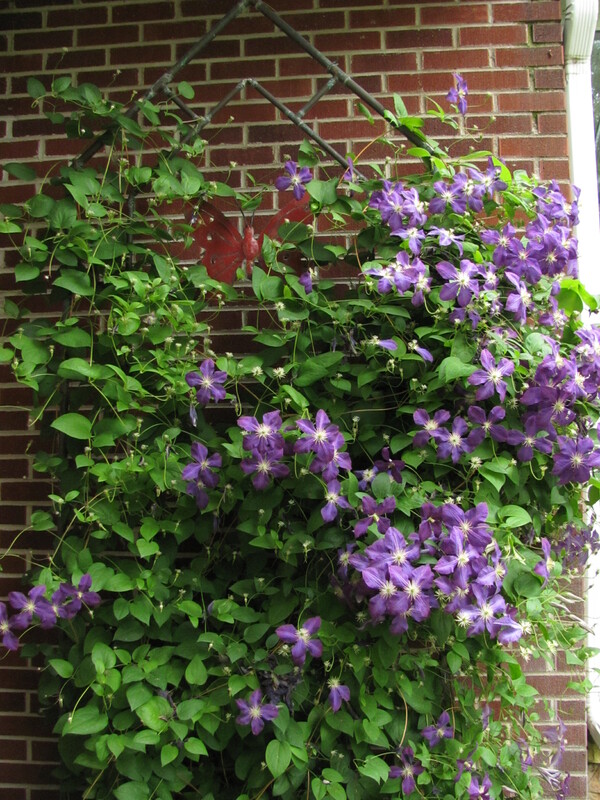 Bruce Keating’s scrap metal arbor, festooned with clematis, makes a gateway to the garden. Table grape varieties that do well in our area, according to the Cheyenne Botanic Gardens’ tip sheet, include Concord, Valiant, Reliance, Himrod and Swenson Red. Categories: Trellis and vine | Tags: American grape, arbor, clematis, climbing rose, garden, gardening, honeysuckle, hops, morning glory, pergola, rose temple, silver lace vine, sweet pea, trellis, trumpet vine, vine, Virginia creeper, Wyoming | Permalink.